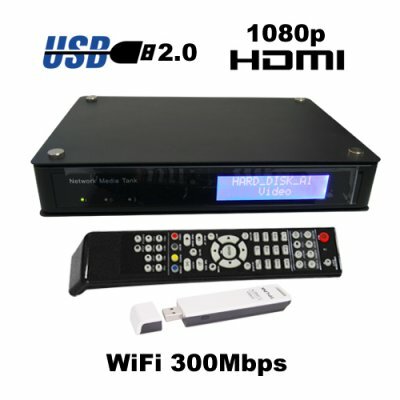 Successfully Added 1080P HD Media Tank - Media Network SATA HDD Enclosure with WiFi to your Shopping Cart. The king of all Hi-def HDD network enclosures has arrived! This top of the line, media and network station supports up to 2TB 3.5 SATA HDD, and comes with the best HD resolution of 1080p. This out of this world multimedia network system is what you would expect NASA to install on their space shuttle. The E49 Media Tank network media enclosure is perfect for any movie or music fans, this unit comes with WiFi, HD 1080p ready, supports up to 2TB HDD and connects to your network allowing for media file sharing and accessibility via a wired or wifi connection. Better still, it comes with a smooth software interface that allows you to easily browse the installed HDD, other drives on your network, or even internet website content. So, if you're thinking of getting a HDD digital media player then this is the HDD enclosure that you should get! With the units Media Service Portal interface, the world is truly your oyster. Instantly gain access to the best social generated content websites in the world, such as Youtube, Flickr, Mediafly, Cnet Tv, Weather Blog, Veoh, Blip.TV and much more on your big screen TV! The media tank's flexibility provides you with the versatility to browse and search for your favorite online videos, photos and music. In addition, to Media Service Portal, Listen to internet radio, and access the MSP (Media Service Portal) Community, that consists of an abundant feature set of site's to access with the remote controller provided, such as Gmail, weather forecast, Google maps, torrent plaza and many more. The CVJI-E49 is built with an all round aluminum case and SIGMA design chip-set that allows for its exceptional performance. This new HDD network media enclosure is the ultimate home and office backup or network media drive. Never again do you have to worry about losing Gigabytes of work and media files from your servers and network hard drives. With sheer powerful performance and unbeatable crisp display, you will never experience entertainment of such quality for another decade. The future of entertainment is here - the CVJI-E49 HD Media Tank. This unit is designed to be used both for individual, commercial and industrial use. And the greatest thing is, it's available to you at a low factory-direct wholesale price. Get one today to experience first hand the power of the E49 Media Tank. Available to you from the leader in factory direct wholesale electronics, Chinavasion. Note: It is highly recommended that you read the user manual instruction carefully before setup and installation for best performance. This is the best HD media unit ever! The only way the E49 Media Tank could get better is if it came with a happy ending. This is the Ultimate HD "think tank" - extremely useful in every business and household. If you love technology, then you are guaranteed to love this unit! Who needs an external HDD enclosure? Everyone! Backing up important data should be a priority for anyone living in the modern digital age. Additionally, transporting files in excess of 32 GB's is impossible for most USB drives and SD cards. This unit supports humongous capacity HDD devices so it is perfect for the modern digital home or office.